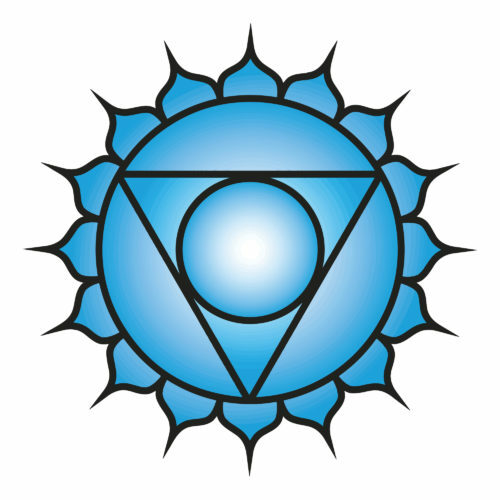 The throat chakra, Vishuddha, is the first of the upper three spiritual chakras, and this energy center is connected to the ether/sky. The throat chakra is the center of communication and interpersonal relationships, and to be open and aligned in the fifth chakra is to speak, listen, and express yourself from a higher form of communication. The fifth chakra – the sound chakra – is located in the throat. it deals with truth and is blocked by lies – especially the ones we tell ourselves. You cannot lie about your own nature. What lies have you been feeding yourself and your Ego? What can you let go of that blocks this chakra? I speak. I speak my thoughts clearly, with grace and integrity. I am aligned with my highest truth and communicate this love and honor. I acknowledge the power of my words to create my own reality. I express who I am. Symbol: The silver crescent is the lunar symbol of nada, pure cosmic sound. The crescent is symbolic of purity, and purification is a vital aspect of Vishuddha Chakra. Mudra: Granthita Mudra – You can use this mudra at your throat to help clear the way for expression of your authentic self. Blocked: Issues with self expression, fear of no power or control. You may come across as too meek/hesitant or overly gossipy, sarcastic and/or negative. Open: Able to express your truth without worrying about what others think. Kind speech, honest, and a healthy balance between listening and talking. Your confidence will shine through in your words.